Friends remind us that today would have been the 70th birthday of Richard Hickox, felled in 2008 by a heart attack while conducting on a Sunday in Swansea. Richard was at once the most enterprising of British conductors and the least pushy. He founded the City of London Sinfonia and the baroque Collegium Musicum 90, recording extensively for EMI, RCA and Chandos, championing the works of British composers from Purcell to the present day. 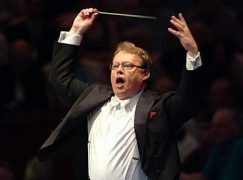 After holding posts with the London Symphony Orchestra and the BBC National Orchestra of Wales, he was, when he died, music director of Opera Australia, a livewire to the last. The shock of his untimely death remains fresh. He is the only conductor ever to have programmed the complete symphonies of Ralph Vaughan Williams. Hickox also conducted Samuel Barber’s “Knoxville: Summer of 1915” with none other than Cheryl Studer, in Istanbul. Would that a recording existed. Don’t recall which orchestra was involved. It was the wonderful Scottish Chamber Orchestra. I played the piano rehearsal. There’s a beautiful DG recording with Kathleen Battle, Orchestra of St Luke’s, conducted by André Previn from 1992. Battle’s is not one of the reference Knoxvilles, beautiful as it may be. When Studer and Hampson recorded the now-classic “complete” set of Barber’s songs, Knoxville should have been included in the set and Studer was fully prepared to record it. But for some unexplainable reason the record label chose to assign the work to Battle and the loss is ours. De gustibus non est disputandum. Probably the reason is that the CD starts with Previn’s song cycle Honey and Rue premiered by Kathleen Battle. “He is the only conductor ever to have programmed the complete symphonies of Ralph Vaughan Williams”. Would you mind clarifying what you mean by that? I’m sure the late Vernon Handley, Andrew Manze and many others may care to disagre! That aside, yes Richard Hickox is very much missed. I attended that cycle of VW symphonies at the Barbican – wonderful concerts. I also remember Hickox conducting a concert of Malcolm Arnold works, including the John Field Fantasy and, I think, the 2nd Symphony (or was it the 5th?). That must have marked an anniversary, and Sir Malcolm was there – he popped up on the podium at the end to thank Hickox and then, very amusingly, gave a demonstration of how he himself conducted. I know him only through his tremendous legacy of recordings, especially those of Grainger, Finzi, Delius, Bridge and other lesser known British composer (especially lesser known to us over here in the states.) He certainly lives on through these. I think he was overrated. Thanks, Rob. An insightful and coruscating comment.. If you have any more such perfect pearls of wisdom, please keep them to yourself, I was just imagining what Richard would have made of your epigramic wit….. Better said that I could have done. I sang under Hickox in a few choral concerts. In rehearsal he was business like and courteous; in concert he gave some terrific performances. In your opinion … but he was more than just another conductor for most of us. That was a huge shock when Hickox died. He had worked in Australia for some time. 60 seems to be a very dangerous age; it was only last year that we lost the incredible Ernst Ottensamer at the same age, and many many others – as noted on these pages. Dear, dear wonderful Heather Harper … who was my singing teacher for some years and then a lifelong supportive friend. Doing this recording with Richard I know was very special for her. They did this whole CD of Strauss songs with the LSO when she was not far off 60 by then and she thought perhaps a bit late, but it is very poignant to have this here with both of them. Such sweeping phrases and the most amazing breath control was in everything Heather did, be it Monteverdi, Wagner, Tippett or Schoenberg. I enjoyed working with Richard the few times I did in London. A truly sad loss, and possibly avoidable.